Mario and Donkey Kong clash in a new action-puzzle game! Mini Marios! 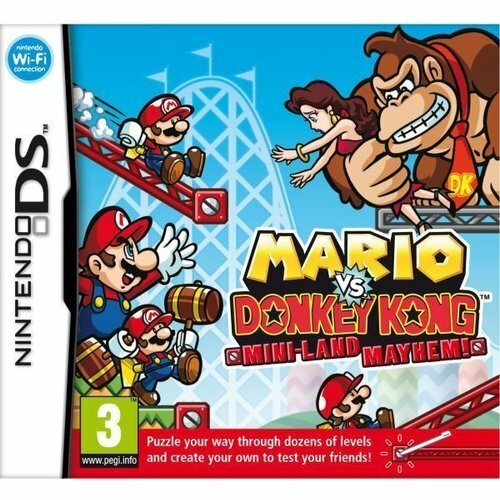 Grab your stylus and tap the Mini-Marios to get the toys marching into action, then use the touch screen to build a safe path through over 200 puzzling levels packed with traps set by DK! Place girders across pits, build ramps, and set springs under ledges to get them safely to the goal but you better think fast - the Mini Marios won't stop marching! Countless levels! Tap into a endless stream of new levels created by other players! Over Nintendo Wi-Fi Connection, you can download and play additional levels. Feeling creative? Build your own unique creations with easy-to-use level building tools or participate in the all-new Challenge Mode, where you'll create a level based on a challenge and submit it into an online competition. The best levels will be voted on by fellow players! Tricks and Tips! Stay on your toes! Moving conveyor belts, devious enemies, warping pipes, and crumbling blocks can help or hinder you as you guide Mini Mario and other toys through levels ranging from easy-as-pie to deviously difficult. If you get stumped, you can always turn to Mini Guide for a helpful hint - the game will take over and show you how it's done. Then it's up to you to beat the level yourself! Participate in the all-new Challenge Mode where you will create a level based on certain criteria. Players can vote for their favorites and the top rated levels will be announced. Use your stylus to strategically place items and solve different puzzles. Once you tap the Mini Marios, be ready to react quickly to help guide them safely to the exit. Access the in-game Help Mode that lets you get more information on key items. Additionally, if players get stuck trying to solve a level, they can now use the new Mini Guide to demonstrate a possible solution. Construct your own levels with an easy-to-use level building tool. You are also able to share your new levels with friends over local wireless or post them online using the Nintendo Wi-Fi Connection. Access new levels created by fellow users with the Nintendo Wi-Fi Connection. Store up to 160 additional puzzles to always take the action with you, wherever you go.